2nd that! How was it done? Basecoat it Bestial brown, and take a tiny brush and make small lines with Scorched brown. then pick small parts of the midtone out with Graveyard Earth! Ramos Asura wrote: heh thanks guys! Noted; Looks like I am gonna be taking more of your ideas. Finally picked up some plasti card today gonna try that hammerhead thing again. Thanks for all the lil tips again. Bah I have not updated my stuff as well....lazy I am. Ramos tries out Vallejo Game Color! So I went out to my FLGS today, and I needed some more paint, as some of my pots are running low. I've heard bits and pieces about Game Color, and decided to check it out. So I get a new pot of Citadel's Bedab Black, and Boltgun Metal, because I know how those behave. Then i got Hammered Copper from Vallejo (because i knew it was an oop color, and copper's a neat color...), Tinny Tin, Glorious Gold, and whatever their Scorched brown is. So I tested them out. Long story short, Im not a fan. The coverage is kinda lousy, even on SB, which in the GW color covers well enough. So, Guess im gonna stick with GW on it. its the same price at my store, so I figure Ill only use Vallejo for the oop colors. And so- Im off again to the painting table! Anywho... A bit of modeling work done! 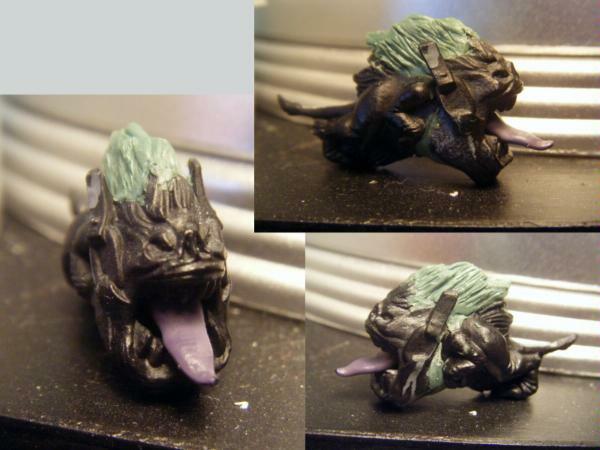 As his "squig-holding arm" will be replaced by the Prod, I freed the little guy, and gave him his hair back! Ill probably have him on a chain. Or maybe just let him loose! Its been a hectic few months over here. Finally figured out possible degree plans and all that, so Im excited. I was in Texas over Thanksgiving (eating much delicious Mexican food, thanks to my friend down there) And seeing as there are NO GW STORES IN OHIO AT ALL, I decided to hit up one down there. Gotta say, I really liked it. Nice group of guys. Bit heavy on the selling, but not too bad. Heh... I ended up loading my suitcase down with a ton of food (yes I got tamales down there =P) and more gitz fer ma waaagh! on top of this, I've got another 20 boyz from tradin off some chaos junk! Needless to say, between this and christmas I will have plenty of updates! And so, I leave you with a parting gift: The firt of my eeeevil plans for next month's project! Oh no! , you arnt doing more mighty turtle marines? LunaHound wrote: Oh no! , you arnt doing more mighty turtle marines? For the great Marines Chrysemys live on! I only bought a buncha orks cause I already had a bunch of marines to paint still (a Land Raider Crusader, 4 AoBR Termies, a Rhino, 5 WiP sternguard conversions, not to mention a couple tac marines). And thus I return to the field of battle... Husks of warriors litter the path, a trail of weapons with their owner's hands still firmly attached. Their black, lifeless eyes look to me as if begging. Begging for a new life. Begging for another chance at battle. Others look on with eyes not yet seared by the flames of war, their coats of gray and silver holding an odd brilliance and cleanliness. In time, the black eyes will take in an inner fire as one by one their brethren don new identities, new faces. Even those untouched by war will take on new shrouds. Their birth is one of battle, one of combat. What once was a stagnant and cold gray is now replaced with fierce yellow or vibrant blue. Warpaint accents fierce snarls and the clatter of fresh steel rings through the air. Weapons mere moments old, but holding the experience of ages. One figure at front raises a thick, muscled arm, the end of which terminates in a wickedly spiked claw, and in a feral voice that shakes the heavens themselves shouts but a single word. So how ya doing, Dakka? Its been a while. Much has happened though, what with the joys of Christmas and the wonders of dealing with relatives, especially in the world of 40k! New to my lineup are a trio of Meganobz, and at their head the one and only Ghazgull! Backed as always with hordes of Boyz, 20 more now join the Waaagh! A new Battlewagon, a new Trukk. Even the Marines got a little love with the addition of a new Rhino and Assault Terminators! Whats more, is that it has been officially a year since I started my campaigns through the 41st Millennium! Lets get down to business then, shall we? First up, one of the MANZ, freshly cleaned and in the process of being experimentally based! I wanted to make the roadway beneath him look crushed by each step he took. I figured its a few tons of Ork, and no stinkin 'umie road's gonna be able to take da powah! Secondly, work continues on 'Ard Boyz! They are made from Black Orcs and greenstuffed Boyz Shoota arms (konverted to sluggas ya see!). Im surprised how big they are compared to Boyz... Almost Nob-sized! Finally, my brand new Trukk. Bed was extended with plasticard. Mostly for the hell of it, but part because it seems to suit it rather well! Hopefully Ill have updates more often! TWO updates in a week!? Almost done with a bunch of Grots. 20, to be precise. Just need to finish up the teeth and claws, and then base em! Also on the painting table are my first (sort of) commission. 20 BadMoonz Boyz. Finally, something I've been working on for some time now. I'm going to be getting a Resin Kit for my birthday on friday (yay 21! xD ) and among a few other things, I was going to cast up a bunch of custom bases. Eventually I might sell some of them for that little bit of cashflow, so I want you guys' opinions. Am I on a right track as far as these bases? What other kinds of bases would you like to see? Nice workins here, love the big truck. I sorta see what you mean. Ill do some neatening up and final cleaning before casts. How many different bases do you think I should make of this "set"
I suggest that if you want to do a different colour scheme to GW, then look up How to paint ork skin on youtube, there will be a Miniwargaming tutorial on painting orks to where some are a greenish brown, while others are almost a sandy yellow. it actually makes orks look like a natural army, as if they have genetic heridity. If I had a dollar for every dollar I spent I'd have all my money back. No pics this update, Gotta run to school in a few minutes here and popping on for a short update! I got my resin kit on Wednesday night, and since then I've been quite busy casting up pieces and parts! On this pour, Im casting 2 VERY large and detailed components. Half one came out well enough, so I poured the second. I know its good to have mistakes so that you learn from them but.... ugh.... like a third of the bottle of rubber went into these molds and they aren't even usable anymore! That kinda thing kills me. Figured out how to cast the larger part, so Ive been busy casting lately! But naturally, Ive been painting! Taking in account an old idea i had a while back, as well as Brotheralexos' comment on painting skin differently, Ive taken it to an extreme! Allow me to present to you the very first of the Big Red WAAAGH!! My concept was to mimic the Fel Orcs from Warcraft III, and I feel I have the colors pretty well down. This guy needs more purple on him, but thats what test models are for, after all! So! Let me know what ya think, ja? However, Ive got a buncha new stuff in progress!! But what I -did- remember to take pics of are my Mega Warboss. I figure ill run him instead of Thraka. I dont really sense the point in all the points for him, but I digress. The body is Thraka, of course, as will be the arms. The head and chest plate are from the Fantasy Black Orc sprues. Im gonna use a more traditional bosspole rather than the one on there... What Im wondering is if I should keep the skulls dangling on the horns. What do ya think? Next up, the Trukk I got base coated with metal and washed. And finally, the start of an objective marker. And so, Im off to paint again. I appreciate all comments! Amazing job on the Fel Orc and the impressive use of purple. A great color that is very hard to use without pulling a Liberace result. Keep up the solid work. Interesting objective marker. Is it going to be fuel ie:gas or fuel ie:BEER/GROG/ETC! As for you not being able to complete games....being a fellow orc player....stop fielding so many damn ork boyz!!!! Kidding; though, I am curious to the reason of time running out. I think I just have bad opponents ><;; They take the most time, and are unfortunately thus far been little middle-school kids (Im in college mind you). unfortunately a) there are a ton of them who play at my FLGS, a few of them too impossibly annoying for words, and b) 90% of their armies are painted terribly or not even painted!! Flesh has been finished on 12 boyz and a Nob, and I put the first armor color on. Also, got most of the objective built. And finally: Work on the trukk continues. HAHAHA I love the space marine getting squished.